Well, he beat it anyway. And it took him about five minutes, too. In what turned out to be not all too much of a cipher challenge after all, something called the Cipher Challenge has come to a screeching halt. 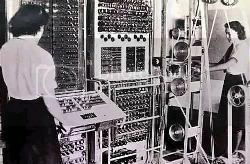 Competing against the famous British code-breaking Colossus computer, which took a full 14 years to rebuild and get up-and-running again, amateur code breakers were put up against the worldâ€™s first programmable digital computer in a contest to see who would be fastest at breaking an encrypted message generated by the original Lorenz cipher machine used by the German High Command during World War II. Well the results were, let us say, sub-optimal. At least for Mr. Colossus they were. He got KO-ed, lost big time, got the tubes knocked out of him. And he lost to somebody usingÂ some homemade computer code, too, somebody who calls himself Joachim SchÃ¼th, of all names, who lives in a country called Germany, of all places. Why that sneaky little German computer geek freak, or KlugscheiÃŸer, if you prefer. A spokesman for the competition said that â€œweâ€™re absolutely delightedâ€ about SchÃ¼thâ€™s victory (yeah, right) and that he had been â€œmuch quicker and did a stunningly good job”. ThenÂ said spokesmanÂ quickly excused himself and ran to the nearest bathroomÂ where he broke into tears. It should be noted that SchÃ¼th used the Ada programming language, an AMERICAN invention used for military systems which was created by the US Department of Defense in 1980, OK? And he used this program on another AMERICAN invention, something we like toÂ call the â€œPCâ€. So there. And if you look closely at the photograph up there buddy boy you will also quickly see that the competition was not very fair at all because Colossus is still in black and white and being operated by two girls. So when is the rematch, four eyes? No user commented in " German Breaks Code That Broke Code Responsible For Breaking German Code Or Something "